The owners of this Federal rowhouse in Philadelphia's Society Hill neighborhood wanted to bring back some of the original details that were still present in the house which had gone from house, to storehouse, and back to single family home in its long history. 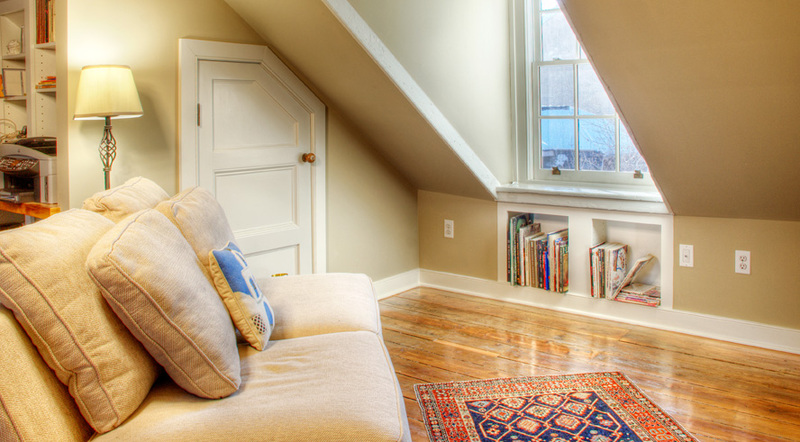 We installed period correct moldings, flooring and fireplace surrounds, while updating other parts of the house to fit the owners’; eclectic style, all with as little impact on the environment as possible. The project won an award from the Preservation Alliance of Greater Philadelphia, so their faithful stewardship of this home was judged a success, and the green features of the renovation have saved the owners energy and increased their comfort. The scope of Phase 1 of the project included complete demolition of all finishes on the 3rd and 4th floors. The spaces were reconfigured, re-plumbed and rewired, and a new high velocity air conditioning system was installed. Spray foam insulation was used on the 4th floor to make the most of the shallow cavity between the rafters, and to air seal the space. We worked with the Philadelphia Historical Commission on period correct choices for the new windows and shutters on the front of the house, and opened up window openings in the rear that had been closed in from their original sizes over the years. We installed a solar hot water system for domestic hot water. Salvaged pine floors were installed and finished, fireplaces were fitted with salvaged mantles and slate hearths, and in the bathroom we converted an old dresser into a vanity with a recycled glass countertop. In Phase 2 we did a minor remodel of the 2nd floor, replacing trim with period correct choices, wiring the TV room for sound, and redoing parts of the staircase that had been poorly remodeled over time. The biggest challenge was matching the original acorn finials in the staircase. Three were missing, but we removed one and were able to mill a great match from walnut. Replacing these and stripping the handrail to expose the original mahogany made a huge impact. In Phase 3 we tackled the first floor. The challenge here was creating a layout that felt open while creating a traditional style space that reflected the home's age. The most important thing for the owners was a sight line from the front to the back of the first floor. We built a new bright and airy vestibule from which you can see straight back to the kitchen through the dining room. Originally, a 12"; thick wall installed between the dining and living rooms in a previous renovation housed plumbing, electrical and HVAC ductwork. We ended up shifting this wall to give one of the original marble fireplaces more breathing room, and designed a paneled, arched pass-through in the middle to connect the rooms while retaining the traditional floor plan. In the kitchen we installed linoleum floors, quartz counters and hand-painted ceramic tiles in a custom colorway selected by the homeowners. "We are very pleased with our renovation and enjoy coming home to the results every day. Buckminster Green made thoughtful contributions to our design decisions and material selections. They did a good job in executing the project and have stood behind their work. We won’t hesitate to partner with them on future projects."